Roger Eatwell coined the term ‘cumulative extremism’ in his influential article on community cohesion from 2006. He argued that ‘different forms of extremisms are constructed in discourse’ by extremist groups to legitimise their own activities, and also noted the ‘varieties of such interactions’. Sometimes, Eatwell argued, extremists could even identify positive features in their chosen enemies, but most commonly they were simply presented as dangerous, thereby justifying equally extreme responses. To expand on Eatwell, one axis that such cumulative extremism revolves around is a process of othering, of identifying and constructing ‘others’ as those posing dangers, even existential threats. What follows in this blog article explores some of the ways that representations of extreme otherness have been developed by the British extreme right, past and present. Indeed, there have been a wide range of examples, past and present, where constructions of threatening ‘others’ are evoked to help develop a politics claiming to defend the very existence of those the extreme right seeks to support, the white population of Britain. Sometimes these are phenomena others outside the milieu might also consider genuinely threatening, such as IRA or Islamist terrorists. Others are ‘radical’ in various ways, but are not really a threat to society, such as anti-fascists. However, for the most part, those who are constructed as extreme ‘others’ are only really identified as a threat due the distorting lens of extreme right ideology, such as Afro-Caribbean migrants, who have regularly been presented as criminal and threatening in extreme right discourses; or Muslim communities, again regularly and hysterically condemned as havens for terrorism. … in real politics in the real world, one’s proper choice of enemy is a group who you gain a worthwhile level of extra support by identifying, who you have a realistic chance of beating, and whose defeat will take you the furthest towards your goal. With millions of our people desperately and very reasonably worried by the spread of Islam and its adherents, and with the mass media … playing ‘Islamophobic’ messages like a scratched CD, the proper choice of enemy needn’t be left to rocket scientists. For Griffin, identifying threats being stoked up more widely in the mainstream press, and taking full advantage of these fears, was a key part of choosing which group to argue was a threating other. While he also insisted the BNP would continue to recognise internally what it saw as threats from Jewish people and black people, he felt focusing on Muslims was the way the party could most effectively make its emotive politics relevant to the wider public. This process of ‘othering’ is not new. Historical contexts offer many examples of an ‘other’ being identified, presented as dangerous and threating, and used to legitimise extreme right responses. Turning to material from the interwar period, such as that created by the British Union of Fascists, here there was a clear language of identifying extremisms posing threats, necessitating an equally hard-handed response. The BUF’s engagement with anti-Jewish conspiracy theories was certainly one example, and the party often presented Jews as untrustworthy people as acting against British interests. Editions of the BUF magazine Action, from September 1936, also decry the threat of the revolutionary left, another ‘other’ for British people to fear. The party’s reporting of the radical left’s activities during the Spanish Civil War, for example, included images of the bodies of nuns that had been burned, and other atrocity images, used to highlight the ‘extreme’ nature of those fighting against General Franco in Spain. An anti-Christian quality was attributed to Communists and others on the left, described as the ‘Church Burners’ Brigade’, for example. While revolving around similar themes, these discourses of identifying others as extreme threats are certainly not ‘static’. 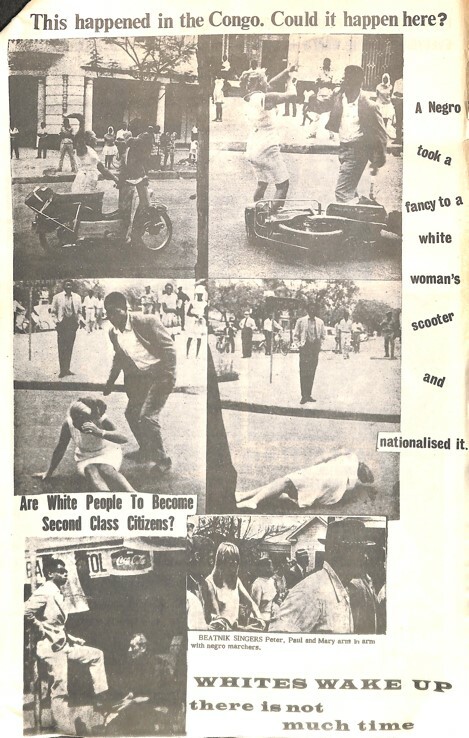 By the end of the 1970s, publications such as National Front News certainly remained steeped in messages framing black people as a particularly threatening other for white people. Often, by this time these messages were juxtaposed with highly critical discussions of the anti-fascist movement. Groups such as the Anti-Nazi League and Searchlight had grown in the later 1970s, and so their development provided more threats to identify and decry. The British Movement was another organisation active in the 1960s and 1970s, and it too offers some further variants on the theme. For example, on 27 October 1968, Tariq Ali, among others protested against the Vietnam War outside the American Embassy in Grosvenor Square, London. The British Movement decried the ways that left-wing students were taking over the capital, and British society in general. Similarly, in June 1973, the British Movement was opposed by anti-fascists in Liverpool. 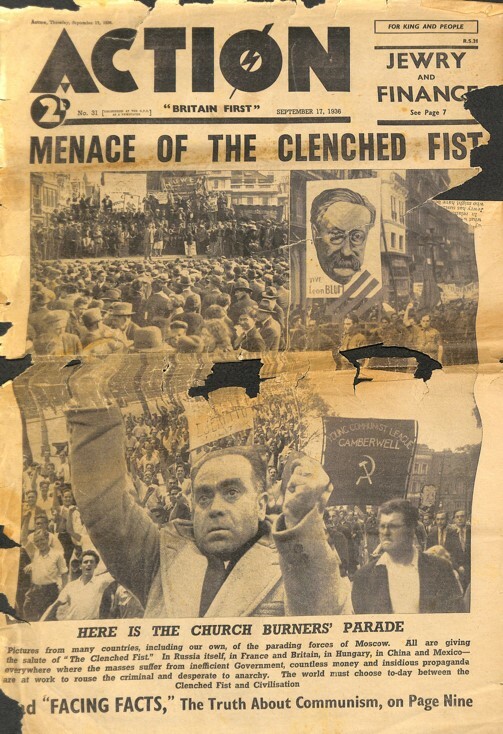 In its reporting on the clash, the British Movement argued that anti-fascist extremists were enabled by the police, and so it used the incident to argue the British state colluded with left-wing extremism, thereby justifying the need for the British Movement to call out and oppose such corruption. As well as anti-fascists, British extreme right materials have regularly presented Irish republicanism, and especially the IRA, as a form of extremism that needs to be robustly challenged and opposed. The British Movement often discussed this issue in the 1970s, as did the National Front. More recent extreme right publications, such as Heritage and Destiny, have continued to engage with the topic, critically and emotively. 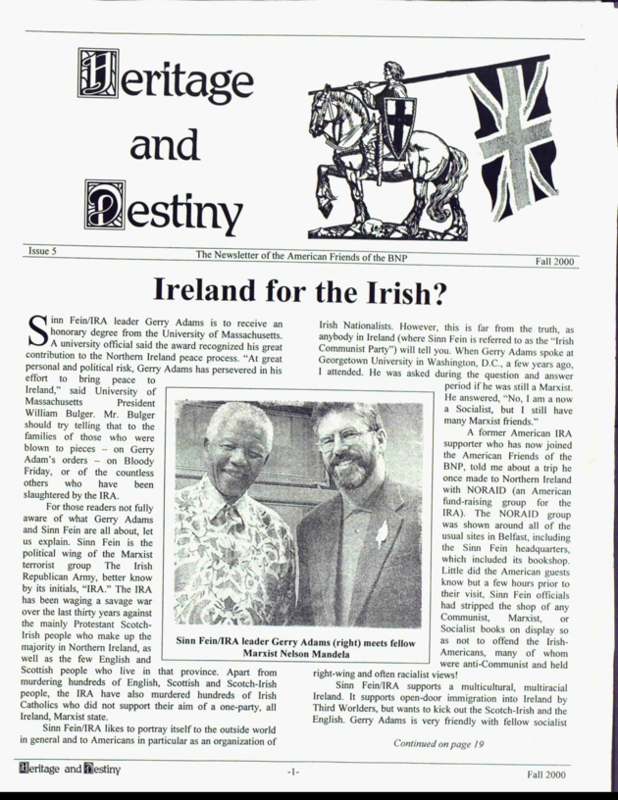 By the 2000s, figures such as Gerry Adams could be elided with others such as Nelson Mandela, to help create extreme right narratives critical of former terrorists becoming acceptable to the liberal political mainstream. 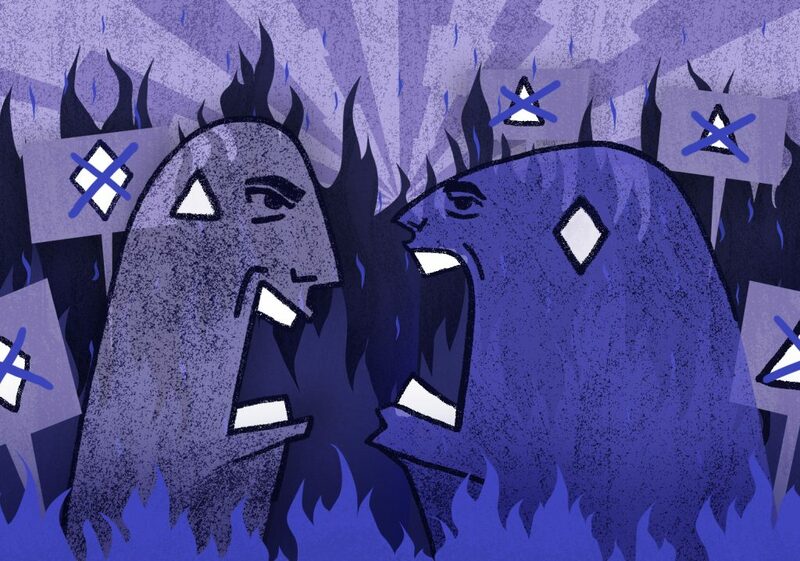 In the 2000s, the extreme right in Britain has continued to use specific developments to its advantage, to style itself as the only solution to threats from other forms of extremism. For example, settled migrant communities have often been represented as hosting pockets of extremist activity. Increasingly, Muslim communities were the targets of such attacks. 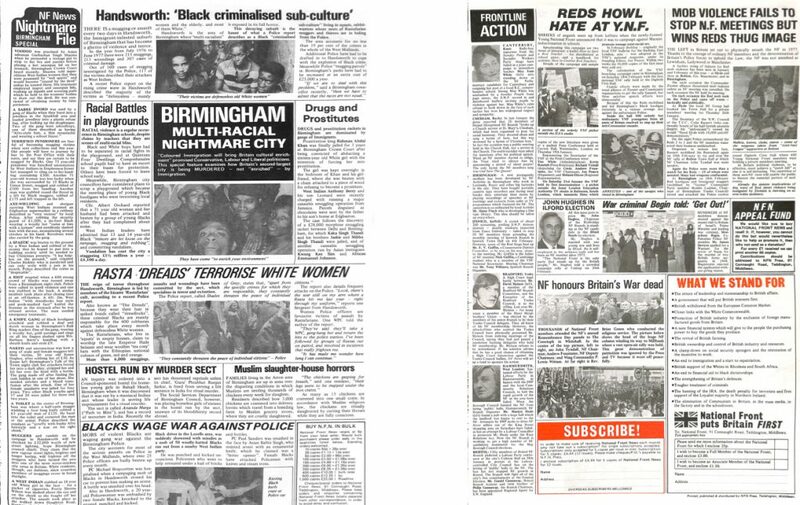 Reporting of the riots in the spring and summer of 2001 in extreme right magazines, such as Spearhead and Gothic Ripples, presented Muslims as an increasingly important ‘other’, used to legitimise the extreme right’s own agendas. In the wake of the 9/11 attacks, this trend only grew. 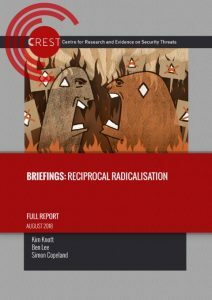 A new set of reference points had been made available to the extreme right, to further develop its narrative of Muslim communities as dangerous. In the pages of the BNP’s more intellectual magazine Identity, its editor in 2001, Paul Golding, was quick to highlight not only that Islam and Muslim communities in general represent a deeply concerning threat, but also that the political mainstream was weak in its opposition to it. Therefore, the political activities of the BNP were justified; they were the only ones who would take a tough stance on the issue. Moving into the contemporary period, more recent British extreme right groups of the 2010s have focused on the binary of defending a ‘Christian’ Britain from a ‘Muslim’ other. Golding’s newer group, Britain First, is the clearest example here, and the organisation has tried to develop a wider appeal though their language of protecting British from attack. In their iteration of the trend, Britain First steeped their politics in a language of defending British from threats seemingly only posed by Muslim communities. They have also developed a uniformed approach, with street patrols and mosque invasions, and even ran events such as martial arts training courses for activists. Golding has taken to a new level the discourse of defending Britain from a Muslim ‘other’ that he started in the BNP. In different ways, National Action provides another good example of an extremist group evoking ‘others’ to legitimise extremism. National Action typify a long trend of anti-Semitic conspiracism and British neo-Nazism, with a heritage that goes back to Colin Jordan among others. However, while National Action have criticised the revolutionary left and hyped Islamists, they have also seen them as inspirational. The group adopted the term ‘White Jihad’ to describe its actions, while the narrative of the Bolsheviks and the Russian Revolution was talked about positively as a tactic in their early document Attack. British neo-Nazis could appropriate Lenin’s extremist ideal of the revolutionary Vanguard. Finally, the English Defence League was another group that focused on a single ‘other’, Islamism, although at a street level this regularly slipped into decrying Muslims in general as a threat. Its founder, and now leading voice of the Counter-Jihad movement, Stephen Yaxley Lennon, has continued to grow his profile around the narrative of wanting to ‘awaken’ people to the threats posed by Islam, and Islamist terrorism. Curiously, his pseudonym, ‘Tommy Robinson’, is itself derived from Luton Town’s football hooligan culture, arguably another form of extremism. In 2017, Lennon became more active again, and he became a vocal figure at a number of terrorist attacks. Echoing Nick Griffin’s comments on the need to seize on a news agenda to help gain free publicity, in October 2017 he was among others to falsely seize on a car crash at the Natural History Museum in London as a terrorist attack. However, in May 2018, by reporting live outside on-going trials of Muslims, his most recent attempt to ‘awaken’ the British public to threats allegedly posed by a threating ‘other’ has resulted in a jail sentence. Surveying a wide range of materials from British’s extreme right, past and present, reveals some interesting things. For the extreme right, there are a wide range of groups who can be presented as ‘extreme’ and ‘other’, from Jewish communities, to anti-fascists, to black and Asian migrants, to mainstream institutions such as the government or the police in British far right discourses. While there are enormous distinctions to the impact such groups have on British society as a whole, for the extreme right they can all be used to evoke a threatening ‘other’ that legitimises their equally hard-line responses. In one way or another, this language of identifying others as ‘extremists’ evokes a sense of a white Britain under attack and needing defending from a threat to its ability to survive. Extreme right discourses often are typically critical of the political mainstream for not doing enough to protect society from attack from the others it identifies as posing extreme threats. From a language of defence comes the desire for action. Only they offer an answer to the threats they identify. Dr Paul Jackson is a Senior Lecturer in History at the University of Northampton and specializes in the history of fascism and the extreme right. He is also the curator of the Searchlight Archive at the university, which is one of the UK’s largest collections of material related to the recent history of extreme right groups. He is editor of Bloomsbury’s book series A Modern History of Politics and Violence, and his most recent book is Colin Jordan and Britain’s Neo-Nazi Movement: Hitler’s Echo (2017).